By the power of my blog, I convinced my friend Matt to order himself an AeroPress. I hope he ordered it via a link on spunkybean so I get, like, 13-cents …but either way, I convinced him. Matt is like me …a curious sort of chap who loves coffee and loves interesting things. If I had one friend who would see my whacky coffee making contraption and want one, I would’ve guessed it would’ve been Matt. (he has two grills – one charcoal and one gas that he uses depending on the cuisine needing grilling, and he and his wife cook elaborate meals for their company and house guests, and food prep typically takes hours while everyone enjoys wine, good conversation, and gets perfectly hungry to enjoy his amazing meals …I tell you all this because an AeroPress is right up his alley). He was so intrigued, it turns out, he ordered one and paid the extra/rush shipping so that it would arrive while he was on vacation. That’s dedication to good coffee. Be impressed. 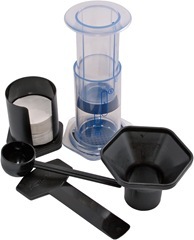 Anyway, upon his return from vacation he agreed a single-cup of AeroPress coffee is about the best he’s ever had, but he said he had some challenges when brewing a full AeroPress and trying to figure out how to make coffee for more than one person and more than one cup. I’m going to show him how. What follows is a quick video tutorial on how I make 8 ounces of strong espresso and cut with water to make 2 8 oz cups of perfect coffee. I employ the upside-down AeroPress technique when making multiple cups. And, yes …in the background you’ll hear my 4-year-old waiting for her cup of coffee and asking for milk. I’d laugh in your face if you were an adult looking to defile a cup of perfect coffee with “milk” …but she’s 4 …so I let it slide. When she’s six …she’ll only be allowed to drink her coffee black. Total immersion of the grounds in the water results in rapid yet robust extraction of flavor. Total immersion permits extraction at a moderate temperature, resulting in a smoother brew. For more analysis and quotes from coffee experts, visit this article at CoffeeGeek. Am I blogging for one person? Perhaps I am. Or maybe you’re getting closer and closer to buying your own AeroPress and living the high life. I hope you do. See you tomorrow.